We are the sort of people that not only like having projects around our house, we will come help you with projects at your house too. This last week has been spring break for Edie, meaning we aren’t tied down to the homestead and we can take the show on the road. After spending some quality time working on the neighborhood chicken coop in Brian’s back yard (there will be chickens this spring, just as soon as Brian & I can figure out what kind we want! ), we hit the road to visit friends in Harrisonburg. There was a most lovely Sunday Funday party, where it was commented that the last time some of those folks had seen me I had taken over the same friend’s kitchen and baked to my heart’s content, as I did this time. What can I say? It is what I do. I think most of our friends like this about me, especially considering I usually leave the kitchen cleaner than I find it and I leave fresh baked treats. In this case it was chocolate chip cookies and a few loaves of bread – some black olive & rosemary, as well as some just plain rosemary loaves, as I hadn’t noticed Edie had chopped up most of the olives I had on hand while making dinner the night before. I’ve found that’s a great new way to get her to stop complaining about dinner taking so long, is to get her to lend a hand towards the prep. So far, it’s worked. But you know kids, once you think you have a handle on whatever the current stage is, they mix it up and confuse you again. We also headed to see friends in north western Virginia. The idea was to make their farm home base while we took some day trips into the city. 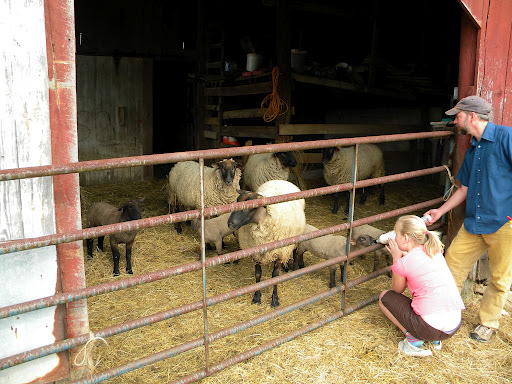 Earning our keep there meant doing things like checking the chicken coop for eggs and bottle feeding the lambs. 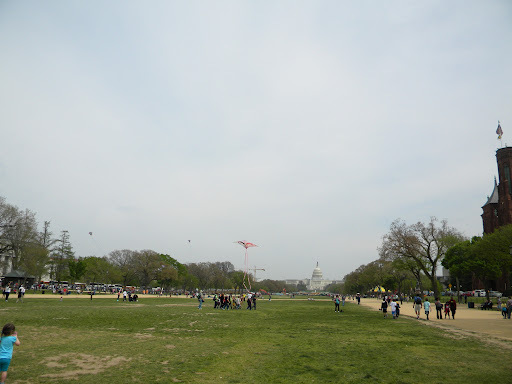 Amazing how you can be doing something like that and just a short time later, you can watch people flying kites on the National Mall. Since Edie was in preschool, her spring break has consisted of the two of us heading to a city to take in the art museums. Spring break has always coincided with Pat’s job picking up steam, and being an environmental educator and the schools across the state having different spring break schedules meant he was generally pretty busy, sometimes even out of town himself. I’m not a big fan of sitting around the house, playing single mom, especially when all her pals are out of town too, so packing up and hitting the road always seemed like a better idea. Pat’s job change last spring however, meant he doesn’t take other people’s kids out on field trips anymore. It means he could take off and go with us this spring break. I have to admit, it did sort of throw me. Edie and I have a routine down. I know if we have to run to catch a train, she can keep up, carting her own suitcase if need be. In my super big mom bag, I will have a brown bag lunch packed, snacks and water bottles. We like to find a nice bench and eat lunch and people watch. I love my husband, but he’s not a city boy. 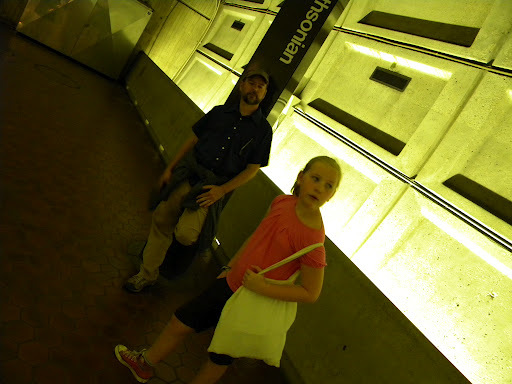 He agreed to ride the metro as driving in DC with me always means taking a wrong turn somewhere, circling around the monuments a few times, inexplicably ending up at the Pentagon where I get my bearings and then can get us to anywhere we want to go. But first, I must circle the monuments and end up at the Pentagon. Always. Doesn’t matter which one of us is driving, I could be asleep in the car and this will happen. Always. It happened to me & Pat just last summer, with a GPS, printed directions and a map in hand. I swear, the magnetic north of my internal compass is set for the Pentagon. To avoid this, we take the metro from the furthest point we can into the city. It’s safer that way. Pat thought we were being silly with the brown bag lunches I dragged along. He felt we were missing an opportunity to discover some fun new lunch spot, heck, why not try some of the museum cafe food? Through experience, I have yet to find anything affordable that I really like near the mall in DC – if someone knows of any, please let me know. The people watching on the mall is just fantastic though. I could make a day out of just sitting there and people watching the entire day. Large school groups in matching T-shirts, even the parent chaperones wearing matching colors. We saw families in matching ensembles, prompting me to suggest we do that for our next family field trip. That went over about as well as you can expect. As we sat on our bench, Pat suggested we make time for the Natural History Museum. Oh, that one I pointed out? The one with all the buses cued up in front, the steps absolutely crawling in school groups in matching T-shirts? Maybe next time when it’s not field trip central. and was pleased to discover it was coming to DC and would be there over spring break. 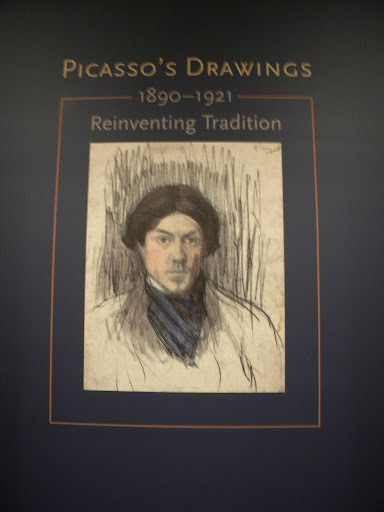 I thought that since Edie declared Picasso “The artist that makes me feel the most”, she’d want to go see this. The collection wasn’t big, three small rooms of early sketches. And I do mean early. There was a sketch he did when he was 9, one when he was 11, in which the raw talent was amazing. You could see a noticeable maturity of his talent in those two ages. There was a watercolor sketch he did of his father when he was 15 that blew me away. I also learned his father was an artist as well – I had not known that. I think she was bummed I didn’t buy her the catalog as we exited this exhibit the way I did with last year’s Picasso exhibit. I will get it for her, but a friend who works for museums tipped me off that you can find catalogs at reduced prices after the exhibit closes, so I think I’ll go that route this time. I do understand a girl needs as many Picasso books as she can get, especially when they are catalogs of the exhibits she has seen. As we left that exhibit, we stumbled onto the next one. We had meant to just breeze through it on our way to the next building, but it stopped us in our tracks. 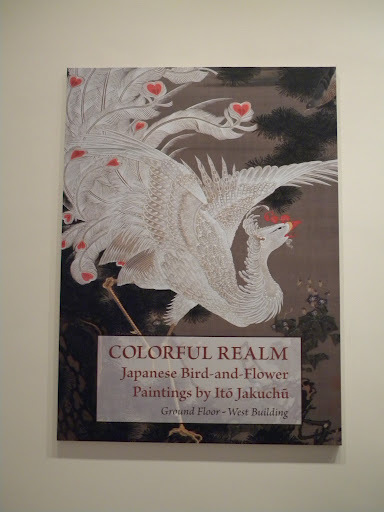 This is the first time these paintings have been seen outside of Japan. 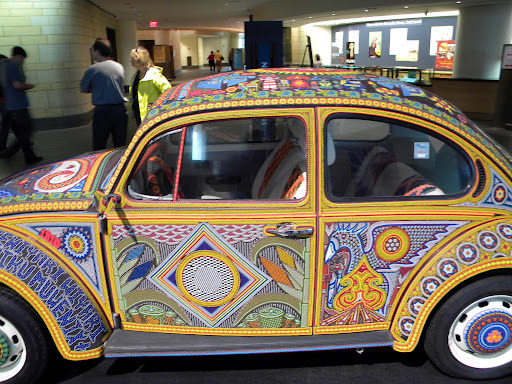 They apparently were just restored – they are all painted on silk panels. They are only there for 4 weeks through the end of April and if you can get to the National Gallery of Art in DC before then, then do so. This exhibit is worth it. These paintings are exquisite. This is the second time we’ve gone to DC to see an exhibition, only to stumble upon another one that we walked away talking about more. The first time, it was the Van Gogh Exhibit, way back in 1998. That was pretty amazing, but then across the mall we found a Star Wars prop and costume exhibit at the National Air & Space Museum. All these years later, we are STILL talking about how flipping cool that Star Wars exhibit was. 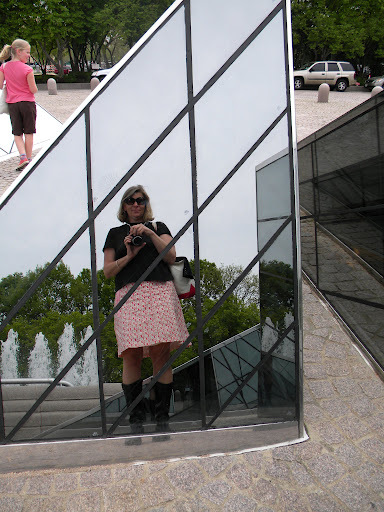 We had fun with the triangles in the concourse between the West and East wings of the National Gallery. 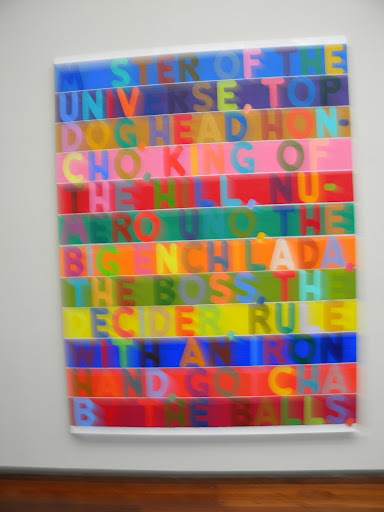 While in the East building, we came across the Mel Bochner exhibition going on in the tower. I liked it, probably because of the color usage. Pat & Edie not so much. I snapped a quick shot before the docent told me no pictures please. Whoops. So of course I have to post my illegal shot. 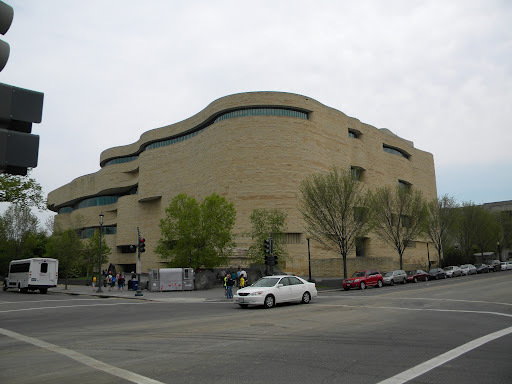 We exited the East Wing of the NGA and headed across the mall to the Museum of the Native American. Pat had heard great things about the food in their cafe and really wanted to eat there. Until he saw the prices. He suddenly got why I had so quickly dismissed the idea of museum cafe food. That’s okay, there were other things to do and see there. Like a VW bug covered in tiny seed beads. I think the hubcaps were my favorite. I wonder how they would look on my car. 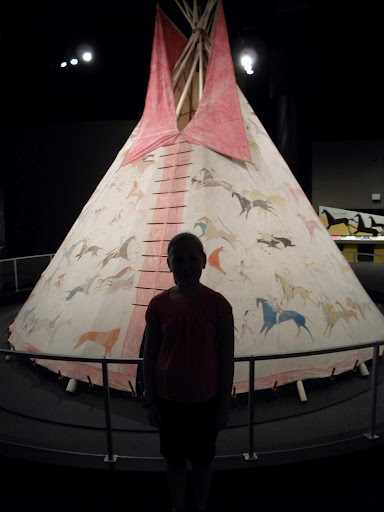 Edie wanted her picture taken by the tipi in the Song for the Horse Nation exhibition. I liked the way this one turned out. I have talked here before how my camera is great with natural light, crummy with any other sort of light. One of these days I will get a fabulous camera that’s not a point and shoot that can take pictures in all sorts of light. Until then, I just live with it and appreciate the unique perspectives. I think the shadow in front of the tipi is more fitting anyway. Finally, after a long day of walking up and down the mall, we made it back to the Metro station. And before long, we were back to lovely scenes like this through our windows. I do love the rolling hills of western Virginia. 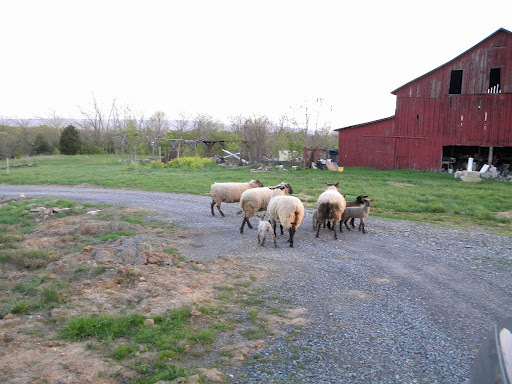 When we arrived back at the farm, the sheep were waiting for us in the driveway. They were quite welcoming. Those little lambs are just darling. 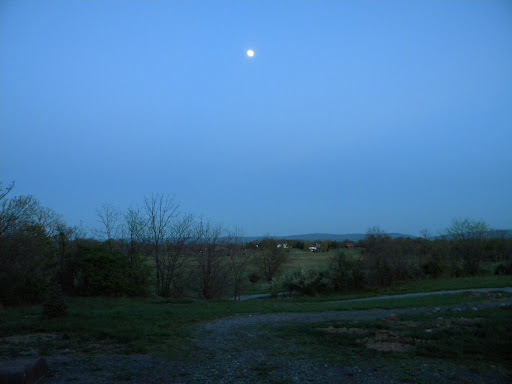 Twilight, with the not-quite-full-moon rising over the Blue Ridge, just to the east. That’s the view our friends have from their front porch. 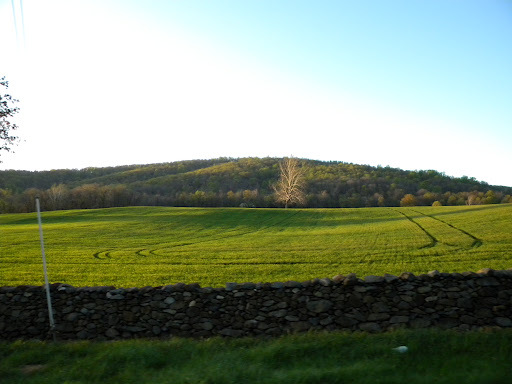 Pasture, rolling hills and mountains. I think it’s quite lovely. Their house belonged to Ryan’s grandparents. His father was born in that house. That view has been part of his life as long as he can remember. You can see his parent’s house across the pasture. That’s the view out back from their kitchen window. 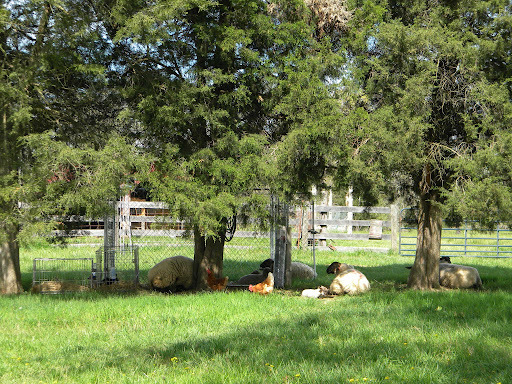 The free range sheep and chickens hanging out with the rabbits in their cages. Just to the left of that is a pasture that had cows, horses and Ryan’s dad’s sheep grazing. Everywhere you looked was some sort of animal. We even saw some deer frolicing. We talked about heading back into the city for another day of museum hopping, but frankly, we were wiped out after the day we had had, and did I mention Pat’s not a city guy? He wasn’t overly excited about it, so we had a lazy morning on the farm before heading home to start knocking out some of our own projects, like maybe get some of those plants sitting on the kitchen counter into the ground and figuring out if a long, slow deep watering will make the butterfly bush perk up or if I shouldn’t just hack it back and see how that goes.